The basis of every towing package - and the first thing to select - is the hitch. Before you begin the hitch selection process it's important that you realize that the hitch by itself will not provide you with the ability to tow. 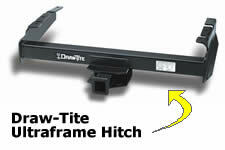 To select the right hitch, you need to know information about your tow vehicle and trailer. What are the different hitch classes? What are the major components? In addition to the hitch, you must have towing components such as a hitch ball and or ball mount, wiring, safety chains and automatic transmission cooler in order to safely and legally tow. Data generated in 0.00227 (s) from 6 queries.